Even before the advent of biosimilar products, biopharmaceutical products faced life-cycle concerns. The discovery–development–licensure process is just the beginning. Drug sponsors hope each new product will enjoy decades of relevance and generate millions of dollars in sales. But “me-too” products will come along, process technologies will change, and patents will expire. Even product innovators have to think about comparablity. Out-of specification results can signal problems that have their roots in raw material choices and sources, equipment deviations, analytical method limitations, or training and standard operating procedures. Regulatory authorities expect to see appropriate corrective and preventive measures taken. And if process changes become necessary, they must be reported in compliance with the rules. Risk management is importantwhen it comes to making product and process-related decisions over time. And quality by design (QbD) approaches to process development, validation, and integration will help companies manage their supply chains for now and into the future. TAKE-AWAY: CREATE MORE VALUE FOR PRODUCTS AND PRODUCT CANDIDATES THROUGH THE LATEST STRATEGIES FOR PROCESS DESIGN, IMPLEMENTATION, AND CONTINUOUS IMPROVEMENTS. Outsourcing is increasingly important to product life-cycle management — as more and more companies contract out for testing, development, and/or manufacturing (1,2,3,4,5,6,7,8). At the 2011 BPI Conference, both a strategy discussion forum and a symposium address aspects of contract manufacturing. 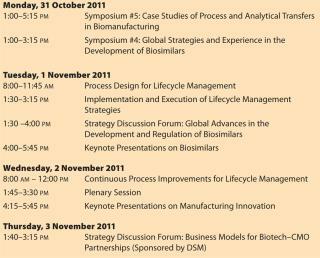 Sponsored by DSM Biologics, the forum on Thursday afternoon, 3 November 2011, will examine business models for biotech company partnerships with contract manufacturing organizations (CMOs). Financing is critical to bioprocess development. Many CMOs offer a straightforward fee-for-service model; others mix that with project-specific application of technologies that can improve project timing and cost. Some even provide an option for later licensing rights. At the strategy discussion forum, a panel of experts from leading CMOs will offer their perspectives and discuss individual characteristics of each business model. Potential customers can express their needs and receive information to help them determine which model would best fit their companies. On the afternoon of Monday, 31 October 2011, a symposium offering case studies in biomanufacturing process analytical transfer will address outsourcing amid other types of technology transfer. For example, XiaoPing Dai (cell culture and fermentation development manager at Bristol-Myers Squibb) will describe some process development strategies for transferring cell culture technology to fit a CMO or other manufacturing site’s facility. In a case study presentation, Dai will explain BMS’s approach to defining process parameters for inoculum expansion, seed and production bioreactor stages, and small-scale runs for developing robust processes. “Monitoring and troubleshooting at early transfer stages assisted in successful technology transfers during scale and facility changes,” says Dai, who will also discuss media ID test methods, supply logistics, and customizing feed-media composition and preparation suitable to a given manufacturing facility. Whether outsourced or not, methods transfer is always a challenge (9)(10). So what is life-cycle management, and how does it work for biotherapeutics? Clive Patience (senior director of technical development at Biogen Idec) plans to answer that question on the afternoon of Tuesday, 1 November 2011. He says therapeutic products are sold in a crowded marketplace where patients, physicians, and nurses are faced with difficult choices — both in their initial drug selections and when changing from one existing therapy to another. “Companies invest in life cycle management to be considered in those decisions,” says Patience. He will provide examples of efficacy-based, product-based, and device-based management to illustrate how biopharmaceutical organizations can make sure that happens. The same morning, Kenneth Green (director of operational excellence at Pfizer Inc.) will focus on process improvements, which are a primary aspect of product life-cycle management (12,13,14,15,16,17). He will discuss approaches to prioritize and implement such changes for marketed products by considering business drivers within regulatory frameworks. Green will identify best practices and diagnostic tools, using case study examples of knowledge management, process understanding, process capability, project prioritization, and lessons learned. In a fast-developing industry such as bioprocessing, legacy systems (and the products they make) could become obsolete if their sponsors don’t keep up with progressing science and technology. Case studies at the conference will illustrate these ideas in more detail. Process optimization can be an ongoing effort that doesn’t stop once a product is licensed for sale. For example, on Tuesday morning, 1 November 2011, Rahul Godawat (a purification process scientist at Genzyme Corporation) reports on a feasibility study that his company performed before integrating cell culture processes with continuous downstream processing. Such integrations have been of great interest in recent years. Genzyme investigated technologies involved in linking continuous downstream processing seamlessly with a perfusion cell culture process for proteins. Godawat will examine the design and use of a multicolumn, periodic, countercurrent chromatography (PCC) system for continuous capture of a target molecule. He will also present data comparing PCC with batch-mode chromatography to highlight the process and economic benefits of continuous capture. ort on his company’s resolution of a possible potency issue with Tysabri (natalizumab) injection, a monoclonal antibody for multiple sclerosis treatment. During late-stage development of the purification process, a potency assay revealed subtle differences between the early clinical and late-stage versions of the drug. An investigation demonstrated that the large-scale purification process reduced the amount present of a minor product-related molecular species. Correlating that change in potency with removal of the product-related impurity allowed the program to proceed without interruption. Instead of posing a risk to patients, it turned out to be an unintended process improvement! Assessing and managing the risks to product safety, quality, and efficacy of each raw material and unit operation in biopharmaceutical manufacturing is essential for following the US FDA’s quality by design (QbD) initiative (18,19,20,21,22,23,24,25,26). Once QbD becomes the norm, its tenets can feed back into legacy drugs and systems over the years — as well as guiding companies in development of their new products and processes. Ron Taticek (senior director of pharma technical quality at Genentech, Inc.) kicks off the product life-cycle management discussion on the morning of Tuesday, 1 November 2011, by explaining how QbD fits in with all these considerations. “One key element of licensing a product via QbD is establishing a regulatory agreement on change management and reporting,” Taticek says. Such agreements cover changes within and outside of a design space through comparability and change management protocols — as well as changes to control strategies and monitoring of processes and products. By way of an example, Taticek will overview a postapproval life-cycle management plan being developed for one antibody his company is licensing through QbD. Product and process understanding with QbD helps manufacturers of biosimilars as well. “The complexity of biologics makes development of biogenerics a challenge,” says Ganesh Venkataraman (chief scientific officer, research vice president, and cofounder of Momenta Pharmaceuticals, Inc.). “Insight into developing a process to generate an equivalent molecule, however, can be obtained through characterization of the target molecule.” On the morning of Wednesday, 2 November 2011, Venkataraman will present a case studying showing how an informed QbD approach can be leveraged in developing a biosimilar product. One company has established its own rapid, flexible, and efficient processes to enable safe and reliable supply and rapid advancement of candidate molecules. Successful application of such processes, according to Mark Moody (vice president of analytical services at Merrimack Pharmaceuticals, Inc.), requires a corporate culture that “understands and tolerates the challenges that arise during drug development.” On Tuesday morning, 1 November 2011, Moody will present case study examples suggesting that the benefits of his company’s approach outweigh the associated development challenges. Case studies and new, unpublished data form the basis of the BPI Conference program this year. For example, Genentech, Pfizer, and Human Genome Sciences are sharing their experiences in process optimization using QbD and guided by risk assessments — both upstream and downstream. On Tuesday morning, Kara Calhoun (senior late-stage cell culture engineer at Genentech, Inc.) describes implementation of an alternate protein hydrolysate in a commercial CHO cell culture process. “As part of Genentech’s program to reduce single-sourced raw-material supply risks,” she explains, “we implemented an alternate peptone in a commercial CHO cell-culture process.” Calhoun will present the steps involved: from identification of a suitable alternate peptone through completion of scale-down characterization and validation studies to execution of full-scale qualification runs. Later that afternoon, Ayda Mayer (director of fermentation and cell culture sciences in biopharmaceutical development at Human Genome Sciences, Inc.) will show how her company mitigated upstream manufacturing risk through media pasteurization. “Despite the controls in place,” she says, “potential for viral contamination still exists in a cell-culture–based production facility.” Contamination events can cause facility downtime and incur significant cost. To reduce the risk of such problems occurring, her team implemented a media pasteurization step into its upstream processes. She’ll provide viral kill data as well as describe the related process development and scale-up activities. Raw materials can be a source of several types of risk, from supply interruptions to contaminations to process variability. On Tuesday morning, Jennafer Lyons (senior scientist in purification and process development at Pfizer Inc.) will report on downstream process work to mitigate variability. Raw material lot-to-lot variability that is acceptable to a supplier can be unacceptable for its customers, Lyons says, so “investing the resources to understand the impact of raw material variability can provide for future flexibility.” Her case study will describe how her company addressed resin lot variability in a manufacturing process. Biosimilars are no longer just a possibility, but rather a reality (27,28,29,30,31,32,33,34,35). For some companies, they present great opportunities; for others, potential threats. Because of their increasing importance to the biopharmaceutical market, the BPI Conference is devoting keynote addresses, a plenary session, a strategy discussion forum, and a preconference symposium to this topic — in addition to some regular session presentations. Regulation of biosimilar products varies across the globe (35). The differences range from subtle to dramatic, so an afternoon strategy discussion forum on Tuesday, 1 November 2011, will be devoted to advancing regulations around the world. The biosimilars sector is gaining momentum with ongoing commercial expansion in Europe and Asia. Moderator Thomas Vanden Boom (vice president of global biologics R&D for Hospira, Inc.) will lead a panel of government and industry experts exploring the draft EMA guidance on biosimilar MAbs; development of biosimilars guidance in the United States; European experience with biosimilar products; and perspectives on biosimilars from both originator and follow-on companies. Europe is certainly leading the way in biosimilar regulation, perhaps because of the relative prevalance of national-level health care management — and thus drug cost pressures — among EU countries. The first approved biosimilar product was a growth hormone developed by Austria’s Sandoz (a division of Novartis AG), which hit the European market in 2006. Since then, the same company has launched two more such products: epoetin and a granulocyte colony-stimulating factor. In a plenary session on Wednesday afternoon, 2 November 2011, Joerg Windisch (head of global technical development for Sandoz Biopharmaceuticals) will describe experience gained with these products through licensing, postapproval studies, and pharmacovigilance. He will also outline development concepts for the next wave of biosimilars — MAbs — as well as thoughts on the most recent regulatory developments. For example, determining biosimilarity among biologics is not necessarily based on comparability, which has been defined in US regulations for over a decade. “Comparability and similarity are two distinct concepts,” points out Earl Dye (director of technical regulatory policy and strategy at Genentech Inc.). As defined by regulators, the concept of comparability applies to changes made by one manufacturer to its own process and product. Knowledge of a product’s unique development history, including its program of analytical characterization and link to clinical experience (with both clinical and pre-clinical lots), allows innovators to perform comparability exercises that are not possible for follow-on manufacturers. Dye will elaborate at the same symposium. Even so, biosimilars are expected to significantly increase the global availability of protein therapeutics in time. Development of these “generics” requires enhanced control of manufacturing processes to match essential characteristics of the related originator molecules and make available safe, high-quality, and lower-cost versions of those drugs. As part of the Monday symposium, Neil Schauer (senior director of process development in global biologics R&D at Hospira, Inc.) will discuss the evolving scientific and regulatory framework for biosimilars as well as enhanced manufacturing control strategies that will allow for their manufacture and approval. Approval pathways for MAbs and other complex biosimilar therapeutics are under debate. Strategies can be challenging for establishing similarity between follow-on and innovator molecules at both preclinical and clinical levels, according to Greg Adams (analytical development section leader at Fujifilm Diosynth Biotechnologies). “Therefore the design for the production process for a biosimilar must be carefully considered for its ability to produce a highly consistent, comparable product.” On the afternoon of Friday, 4 November 2011, Adams’s colleague Sharyn Farnsworth will outline a case study illustrating successful process development, characterization, and scaled-up CGMP production of a biosimilar antibody. Their company created a well-characterized small-scale model for high-throughput process development and developed analytical methods for taking the MAb from clone selection through clinical comparability. Meanwhile, of course, originator companies face the challenge of how to compete with those follow-on products in the marketplace. Sales and marketing experts will have a lot to say, as will process and product scientists and engineers. Manufacturing processes evolve for a variety of reasons, such as improving efficiency, quality, or reliability of supply. But enactment of biosimilar pathways is raising questions about the relationship between comparability exercises for manufacturing changes and biosimilar development. On the morning of Wednesday, 2 November 2011, Gustavo Grampp (regulatory affairs director for Amgen Inc.) will address those issues and discuss the differences in the overall context of product life-cycle management. Cheryl Scott is senior technical editor of BioProcess International. Quotes not otherwise attributed are from presentation abstracts. 1.) Niazi, SK, and TL. Flynn. 2006. A Practical Model for Outsourced Biomanufacturing. BioProcess Int. 4:10-16. 2.) Finnegan, S, and K. Pinto. 2006. Offshoring: The Globalization of Outsourced Bioprocessing. BioProcess Int. 4:56-62. 4.) Dale, C, and J. McCool. 2008. CMOs Can Add Value to Outsourced Projects. BioProcess Int. 6:S8-S13. 5.) McLeod, LD. 2009. Manufacturing Efficiency and Supply Chain Security. BioProcess Int. 7:S10-S19. 6.) Nims, RW, and E. Meyers. 2010. Contractee Responsibilities in Outsourced Pharmaceutical Quality Control Testing. BioProcess Int. 8:26-33. 7.) Nims, RW, and E. Meyers. 2010. Contractor Responsibilities in Outsourced Pharmaceutical Quality Control Testing. BioProcess Int. 8:16-20. 8.) Langer, ES. 2010. Biomanufacturing Locally, Thinking Globally. BioProcess Int. 8:S24-S31. 9.) Seymour, P, SD Jones, and HL. Levine. 2010. Technology Transfer of CMC Activities for MAb Manufacturing. BioProcess Int. 8:S46-S50. 10.) Nixon, L, and S. Rudge. 2010. Technology Transfer Challenges for In-Licensed Biopharmaceuticals. BioProcess Int. 8:10-18. 11.) Mauter, M. 2009. Environmental Life-Cycle Assessment of Disposable Bioreactors. BioProcess Int. 7:S18-S29. 12.) Mire-Sluis, A. 2009. Quality by Design: The Next Phase. BioProcess Int. 7:34-42. 13.) Zabrecky, JR. 2008. Why Do So Many Biopharmaceuticals Fail?. BioProcess Int. 6:26-33. 14.) Mire-Sluis, A. 2010. Practical Applications of Quality Risk Management. BioProcess Int. 8:20-32. 15.) Montgomery, SA.. 2010. Product Lifecycle Management. BioProcess Int. 8:S20-S26. 16.) Pritchett, T. 2011. A 483 Primer. BioProcess Int. 9:12-16. 17.) Scott, C. 2011. Quality By Design and the New Process Validation Guidance. BioProcess Int. 9:14-21. 18.) Vega-Mercado, H. 2003. HACCP: A Process Validation Tool for Ensuring Quality of Biotech and Pharmaceutical Products. BioProcess Int. 1:50-57. 19.) Noferi, JF, DE Worden, and RL. Dillon. 2005. Regulatory Risk Management: The Paradigm Continues To Evolve. BioProcess Int. 3:14-18. 20.) Mollah, AH. 2005. Application of Failure Mode and Effect Analysis (FMEA) for Process Risk Assessment. BioProcess Int. 3:12-20. 21.) Avellanet, J. 2008. Shared Risk. BioProcess Int. 6:20-25. 22.) Julien, C, and W. Whitford. 2008. The Biopharmaceutical Industry’s New Operating Paradigm. BioProcess Int. 6:S6-S14. 23.) Julien, C, and W. Whitford. 2008. ”Hitchhiker’s Guide” to Bioprocess Design. BioProcess Int. 6:S52-S59. 24.) Beck, G. 2009. Raw Material Control Strategies for Bioprocesses. BioProcess Int. 7:18-33. id=”CIT0025″>25.) Noferi, JF, and RL. Dillon. 2009. Sailing Through Pharmaceutical Risk Management. BioProcess Int. 7:14-18. 26.) Mire-Sluis, A. 2010. Practical Applications of Quality Risk Management. BioProcess Int. 8:20-32. 27.) Schofield, I. 2005. EU Biosimilar Guidelines: Ahead of the Rest, but. BioProcess Int. 3:72. 28.) Kanarek, AD. 2006. Approval of “Biosimilar” Products. BioProcess Int. 4:80. 29.) Rader, RA. 2007. What Is a Generic Biopharmaceutical? Biogeneric? Follow-On Protein? Biosimilar? Follow-On Biologic? Part 1: Introduction and Basic Paradigms. BioProcess Int. 5:28-38. 30.) Rader, RA. 2007. What Is a Generic Biopharmaceutical? Biogeneric? Follow-On Protein? Biosimilar? Follow-On Biologic? Part 2: Information, Nomenclature, Perceptions, and the Market. BioProcess Int. 5:20-28. 31.) Medina, C, and CJ. Heilman. 2007. Biosimilars and the Changing Environment of Regulation and Reimbursement. BioProcess Int. 5:22-28. 32.) Lundblad, R. 2008. Throwing a Flag at Biosimilars. BioProcess Int. 6:88. 33.) Aagaard, AW, S Purdy, and S. Philpott. 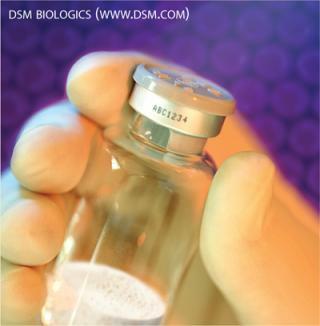 2010. Review, Approval, and Marketing of Biosimilars in the United States. BioProcess Int. 8:12-20. 34.) Bonilla, JW, and N. Beaver. 2011. The New US Biosimilar Legislation, One Year Later. BioProcess Int. 9:22-30. 35.) Konski, AF. 2011. Generic Biologics Comparative Analysis of Regulatory Review. BioProcess Int. 9:34-41.